This incredibly easy Lemon Curd recipe is sweet, tart, silky smooth and perfect for spreading on all manner of baked goods. 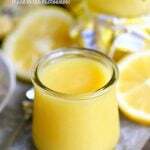 Lemon curd is so easy to make in the microwave and blows store bought lemon curd out of the water. It’s simply amazing and so refreshing! We love to spread it on these The BEST Homemade Biscuits and Lemon Blueberry Scones but I also use it s a filling in these Lemon Meringue Cookie Cups – so good! I have been craving citrus lately. I don’t know what it is, but it seems like every January I go on a lemon rampage that just can’t be stopped. I think it’s my body’s way of telling me – ENOUGH WITH THE CHOCOLATE ALREADY TRISH! I’m only too happy to oblige. Especially when that means I get to indulge in something incredible like this homemade microwave lemon curd. Yep. I totally just said microwave. If you are a fan of lemons, chances are you’re a BIG fan of lemon curd. I know I am! Lemon curd is essentially wrapping up that tart, refreshing lemon flavor in a smooth, creamy package which makes it perfect for all sorts of recipes. 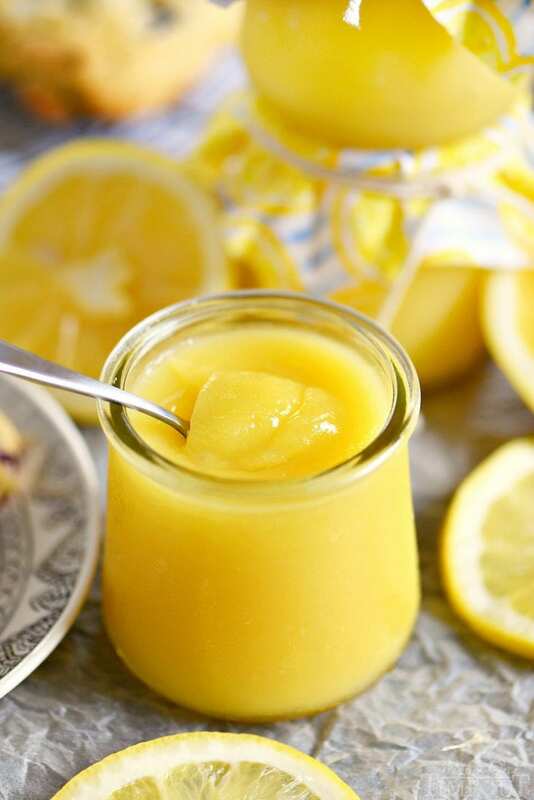 Lemon curd is a type of preserves. It’s made with sugar, eggs, lemon – of course!, and butter. It can be used for all sorts of recipes. I love topping a vanilla Greek yogurt with a dollop of lemon curd, spreading it on a piece of toast or pound cake, and it makes the perfect filling for cakes and tarts. 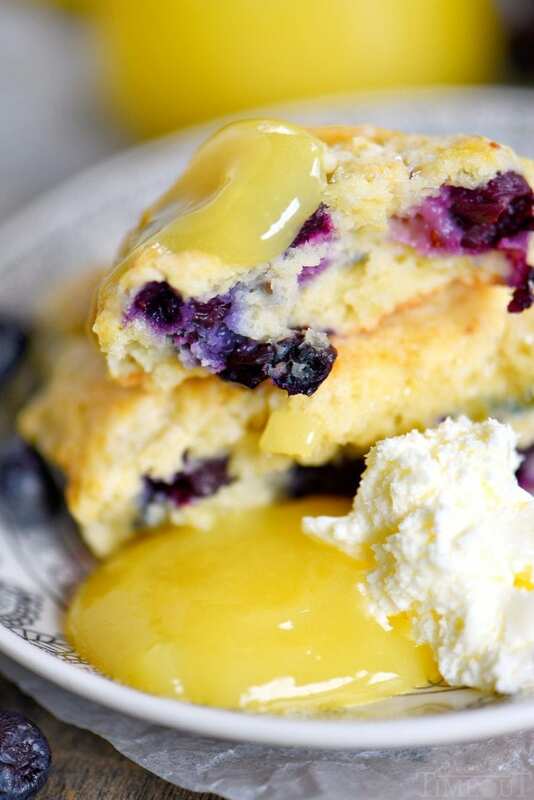 It’s also the perfect spread on these Lemon Blueberry Scones. In fact, I always make up a batch when I know we’re having scones and often when we’re making biscuits. Alright. I might as well be honest here. I also eat lemon curd by the spoonful. Especially this kind. Cause I know just how easy it is to whip up another batch 🙂 Danger, people. Danger. Now I’m sure many of you will be skeptical. I mean, lemon curd in the microwave? Sounds a little far-fetched, I admit. But try this once, just once, and I know you’ll be convinced. The bright tangy flavor and cheerfully bold yellow color will have you smiling in no time. Even on a cold, gloomy day in January. 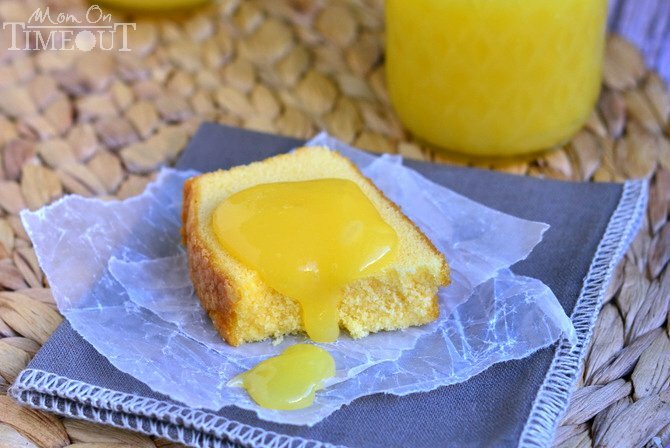 This incredibly easy Lemon Curd recipe is sweet, tart and perfect for spreading on all manner of baked goods. 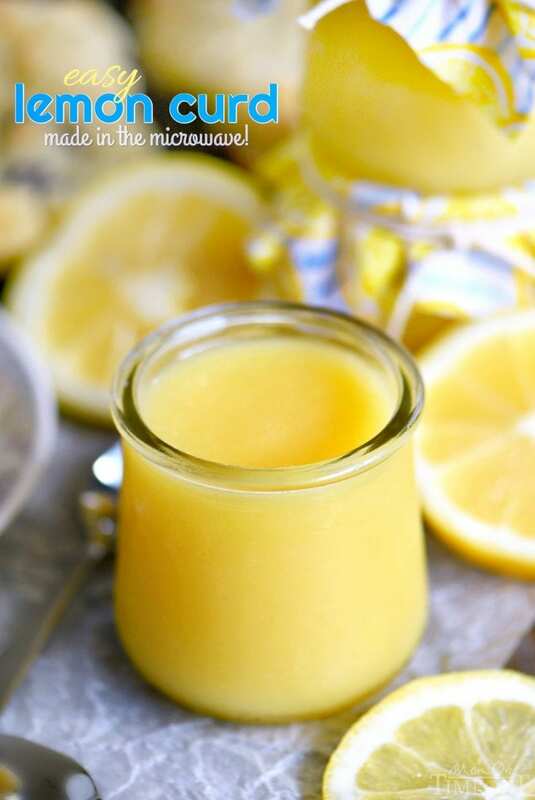 Lemon curd is so easy to make in the microwave and blows store bought lemon curd out of the water. It's simply amazing and so refreshing! Melt butter in microwave, set aside to cool slightly. Whisk together sugar and eggs in a medium-sized microwave-safe bowl. Whisk in lemon juice and zest. Finally whisk in the butter. Microwave on 50% power for one minute. Stir. Strain curd through a fine-mesh sieve to remove zest. Pour curd into sterile jars and store for up to three weeks in the refrigerator. Makes 1 pint or 2 cups. I used to make lemon curd years ago but kind of stopped making it. Not sure why because my family really loves it. I thought I’d try your recipe and sure enough it is just as good as my old one but easy using the microwave. Love it and will use it again. So easy right Jackie? We make this ALL the time and I love it more and more each time I make it. Thanks so much for stopping by! Oooh! I’ve been wondering if that would work! Thanks Carol! In the video it shows 4 eggs but the recipe just has 1 egg yolk. Is this correct? The video shows the three eggs PLUS the one egg yolk as listed in the recipe card. Hope this helps! Just found this and want to try it as I love lemon curd. Can it be frozen or processed and stored like a fruit jam? I see that it makes a couple of cups at least which is more than I can get through in 3 weeks. I have never frozen it but I’m sure it can Heather! Maybe a crazy question, but can you use a sugar substitute? Like Splenda? Hmmmm, that’s a great question but I don’t have an answer unfortunately. I do think it would be worth a try though. Maybe do a half batch and see how it goes? That way you are wasting too many ingredients. You are so sweet Belinda – thank you!